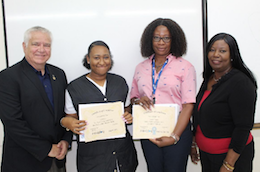 Three students of the Bahamas Technical and Vocational Institute placed first through third in the recent Sandilands Rehabilitation Centre's Occupational Therapy Month speech competition. Police on New Providence are investigating a traffic accident which occurred on Saturday, 13th April, 2019 which left an adult male dead. 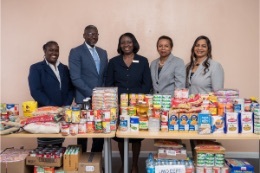 The Bahamas Insurance Association (BIA) hosted a Food Drive during Insurance Month with its members donating an overwhelming amount of non-perishable food items. 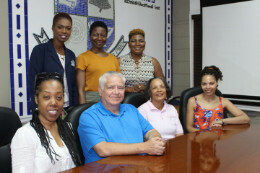 The proceeds of the drive were donated to several community organizations including Great Commission Ministries, The Elizabeth Estates Children’s Home and Eljhay’s Hilltop Cottage Ministry. 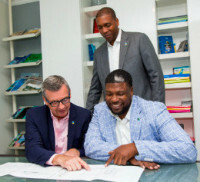 The trial version of a virtual reading program that analyzes individual students’ reading strengths and weaknesses was introduced at the Bahamas Technical and Vocational Institute (BTVI) during the spring semester, resulting in it possibly being implemented in other English classes in the fall. A self-described “girly girl” who loves her make-up, nails, hair and lash extensions, English language and literature teacher Rochelle Anderson is an unlikely volunteer for a youth program known for its foot expeditions and camping outdoors. 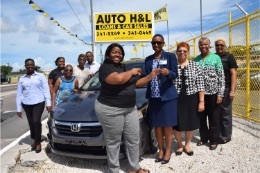 As Sandilands Rehabilitation Centre (SRC) gears up for a major fair and raffle later this year, Auto H&L ltd. has stepped up early as a major contributor towards its efforts to improve the level of care given to those who utilize the centre’s services. A dozen new and relaunched units, 1,208 first-time participants and strong financial support from the public and private sectors over the last year were just a few of the highlights and focus of presentations at the Governor General’s Youth Award’s Annual General Meeting held at Government House over the weekend. “There is a crisis in Math,” according to Chair of Math at The Bahamas Technical and Vocational Institute (BTVI), Archilene O’Brien. Ms. O’Brien’s comments came during the opening ceremony of BTVI’s recent math fest, which included a week of math awareness activities. 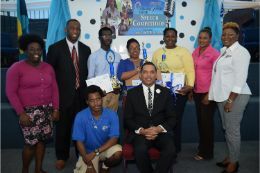 SC McPherson hosted its 8th annual Math Competition, welcoming more participating students and schools than ever before thanks in part to sponsorship from Consolidated Water (Bahamas) Ltd. (CWCO). 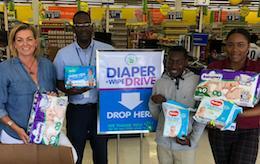 AML Foods Ltd. has come to the rescue of The Grand Bahama Children’s Home (GBCH), in response to an urgent plea made by Executive Director Sheila Johnson-Smith via social media for diapers and wipes for the twenty-six children, currently living at the home in Freeport. 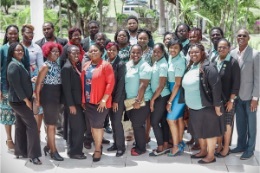 The Small Business Development Centre (SBDC) in conjunction with the University of The Bahamas northern campus hosted its first Pitch Night competition on the island of Grand Bahama. 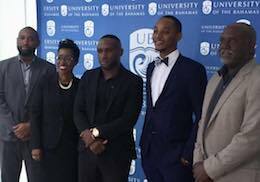 The event allowed six students of the University of The Bahamas to share their business plans with judges and attendees. 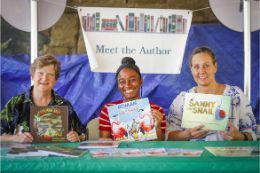 They were unlikely candidates to share a platform – a biologist, a tenth grader and a therapist – and yet a common thread connected them, their knack for writing stories about animals that resonated with young audiences. 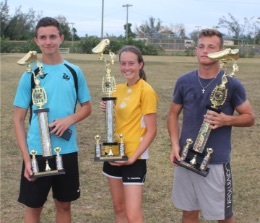 BTC’s Junior Achievement Company, BTC C.T.R.L (Cultivating The Right Leaders) walked away with bragging rights, winning the annual “Product of the Year” competition. The students prepared a customized, all Bahamian coloring and activity booked aimed at elementary school students. 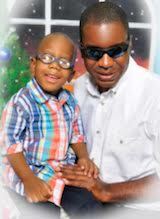 Thus far, the students have sold over 500 copies of the activity book. Her Excellency Most Hon. 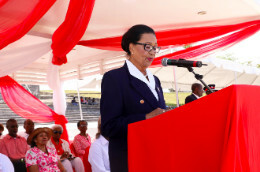 Dame Marguerite delivered remarks at the Bahamas Red Cross Fair on Clifford Park, Saturday April 6. She is pictured taking Official Tour of the 78th Annual Bahamas Red Cross Fair. Music was provided by the Royal Bahamas Defence Force Band and Gerald Cash Primary School's Rake 'n Scrape Band.